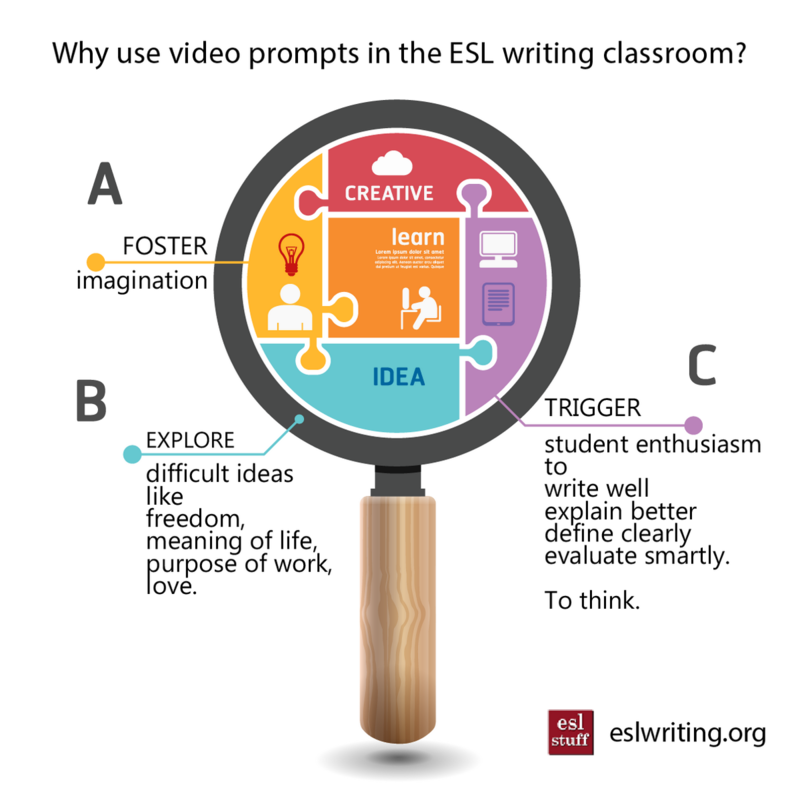 Here are ten videos which can help students learn English writing skills. Most videos are about 4 minutes in length. That means the majority of students should be able to complete a rough first draft in a single 50 minute period. Choose a video for the lesson. Briefly review key words such as plot, character and setting. Students write first draft of a summary which is factual a description of the plot, character and setting. The second part is student input. Depending on the video story, that could mean an interpretation of the message, an opinion about the ending, or discussion about the overall impact of the story. Room 8 is a wonderful, clever video prompt because it can stimulate interesting and philosophical questions about the meaning of life. In addition it requires students to be able to write their descriptions with considerable care and attention to detail. The video is about 7 minutes long but actual in-class play time is about 5:45 minutes (the last two minutes or so are credits). Blind is a Japanese video (with English subtitles) that presents a strong warning to the world, but that’s a message your students will have to figure out. The visual imagery is so compelling, your students will have no problems following the plot. You may want to preteach some vocabulary before watching this video and then follow it up with a few comprehension check questions before students start drafting. Watch carefully, and you will see pictures of the three monkeys (hear no evil, see no evil, speak no evil). Ask students to explain the meaning of those subtle images. Describe the people’s attitude regarding their circumstances. Why is the young girl looking at the picture? Why do they take off their masks? What does the title of the video mean? Howl is splendid black and white animation that works well with students from the higher grades in elementary school to adults. The video is a little long but over the years it has always prompted excellent written stories and student conversations. What do you think about the mother? Does the story have a message? Decade is a short video with a simple plot and a message that’s relevant to university students and adults. It basically asks us to consider what is the purpose of hard study and work. Before watching, ask students to make notes about the different stages of life in the video. a Decade from Treehouse Studio on Vimeo. Ecirava is short video that presents a simple story with an interesting time travel dimension. Click to Next Page for more video prompts. Looking for more innovative classroom activities?